You know how every once in awhile an idea comes along where you say, "Why didn't someone think of that sooner?" Well, here's one! 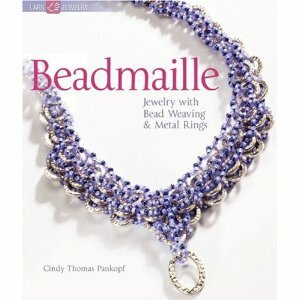 Cindy Thomas Panokpf has written a delightful book showing us how to combine basic chainmaille with bead weaving. Why didn't I think of that? :-) Beadmaille contains 25 fun and contemporary projects that will start you drooling. If you've never done chainmaille...not to worry! Cindy takes you through the basics that you'll need for her projects. If you're not terrific at bead weaving...not to worry either! There are projects for all skill levels, and wonderful illustrations to show you exactly what you should be doing. Would you like to win a free copy of Cindy's new book? Just leave me a comment below and you'll automatically be entered. If you tweet or post on Facebook or other social spots about the contest, you can leave a second comment and be entered twice! In a week, on May 17, I'll randomly pick a winner. Of course I'd like a copy of this book, silly! Count me in please. I saw a necklace she did and thought the same thing, why didn't I think of it, and why hasn't it been done a long time ago. I'm not too crazy for chainmaille but I think CM with Beads is SUPER!! I would love, love, LOVE to receive a copy of the book. Please include me in the giveaway!!! BTW... thanks for providing your new ebook for free. I can't wait to try out the techniques in it!!! I wish I could be the lucky one that win this book, now I go to post the opportunity on my blog and on Facebook. I love the look of chainmaille + beads, this looks like a great book! Oh I would adore a copy. I am trying to branch out into other techniques and such and this would be amazing! love to have the book. Thanks for offering a chance to win a copy. I always wanted to have a go at chainmaille, this book may the the push that gets me into trying it out. I've also tweeted about this. I wanted to thank you for the e-book chapter. Also I would love a copy of the book "Beadmaille" if I should be so lucky--I've been doing chain maille and variations for the past several years. I'm sure this book is beautiful, you're talented, so I sign up too! Please sign me up as well -looks like a fantastic book! Please enter me! That looks wonderful. This would be a terrific way to learn chainmaille! Thank you for the chance. I adore chainmaille!! I adore beads!!! What could be a better combination??? I would so so so love a copy of the book. I saw this book today and fell in love! This book is amazing! Hope I get a copy. *fingers crossed* I've been into beading alot and this book is sooooo great!